There’s something invigorating about exploring a new place for the first time. You can often get a good impression of whether or not you like it within minutes of arriving. If you get a warm welcome, the better chance of a good outcome. When we first arrived in Scotland through Glasgow, we loved it the minute our driver started interacting with us. Although we could barely decipher what he was saying, his demeanour was friendly and his face smiling. After spending a quick and busy 48 hours we picked up our rental from Arnold Clark and off we went exploring some more of the country. 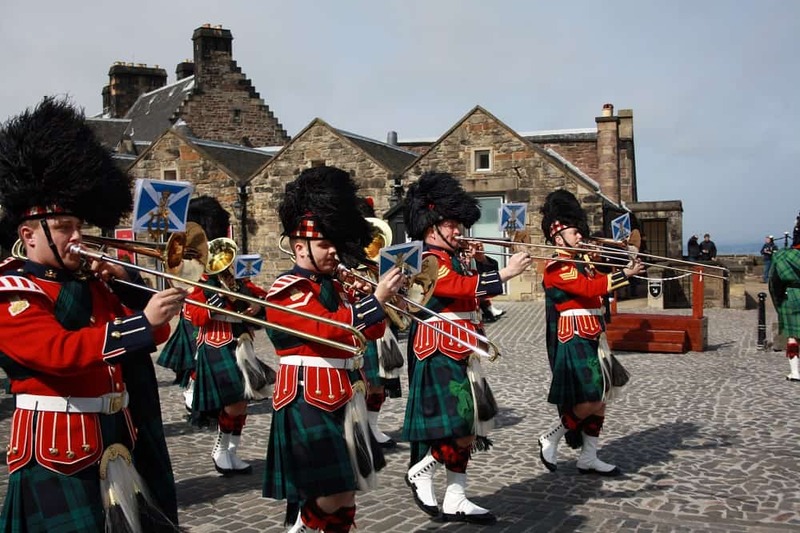 Glasgow is often overshadowed by Scotland’s capital, Edinburgh, but it is quickly becoming known as a culinary and cultural mecca in its own right, with some of the best curry joints in the United Kingdom and so many great museums (with free entry) how could it not. 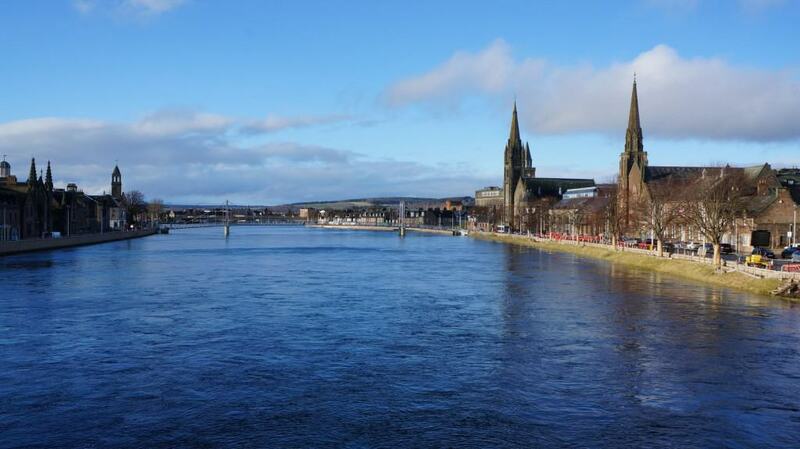 For more on Glasgow and where to eat, click here. After asking Visit Scotland for some pointers and doing a bit of research, we came up with an itinerary for our road trip, a lot of it based on castles we wanted to see. 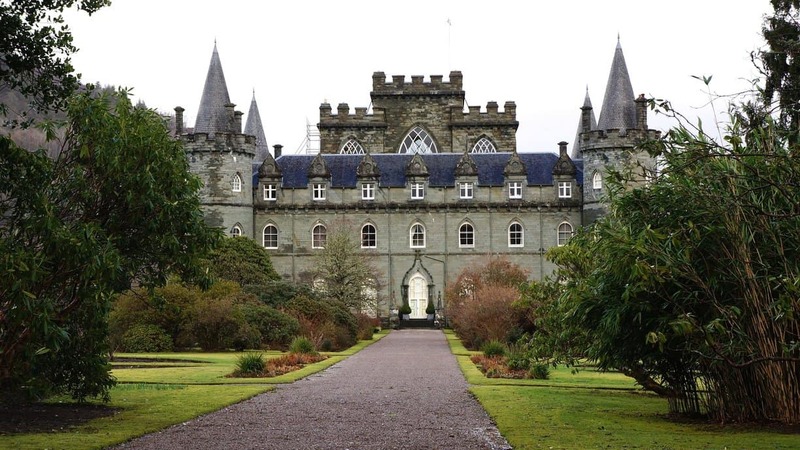 From Glasgow head to Inveraray, home of Inveraray Castle, also known as Shrimpy’s castle on the British series, Downton Abbey. We were there during the off season so the castle was closed but we were able to tour the grounds and take pictures of the majestic structure with its black and grey turrets. During the regular season, they give tours and serve high tea. 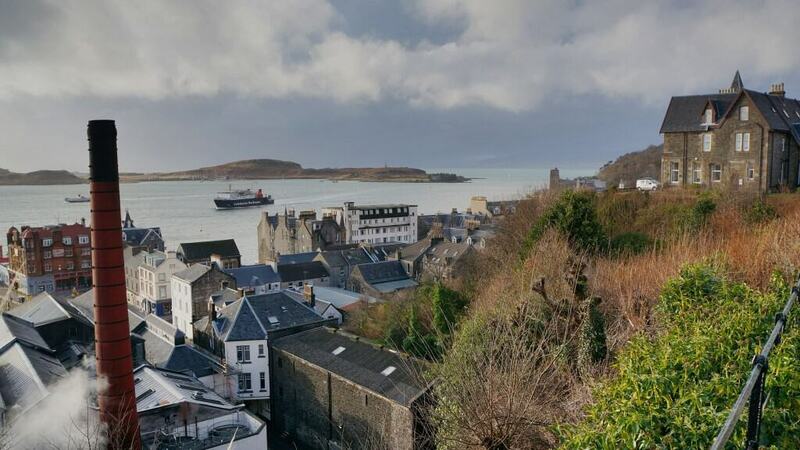 Continuing on to Oban you can visit the Oban Distillery, make sure to call ahead for tour times. We were quickly informed that they had a winter schedule in place and we had missed the tour. The town has a few good pubs, we opted for the oldest and the most popular with locals, The Lorne. It’s exactly what you would expect from a Scottish pub, good beer on tap and pub fare. If you’re in the mood for a gourmet burger, head to Coast, owned by a young couple, the food is fresh and local. 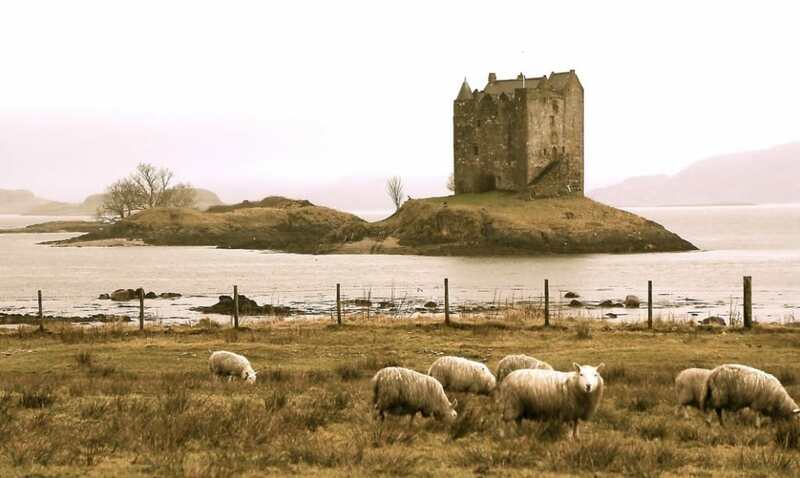 If you continue on towards Fort William you will spot Castle Stalker to the left, the castle in Monty Python and the Holy Grail. The best place to view the castle isn’t at the belvedere up top but just before that, turn at the red mailbox, park the car at the end of the road and walk in a bit. The view is perfect and you might even have some sheep pose for you. Still going toward Fort William there is another castle to be seen, Inverlochy Castle. You have to turn off the road for this one and it is more ruins than castle, but with a little imagination you can picture what it may have looked like in its heyday. Its massive walls and towers sitting by the river are still quite impressive. The little town of Dornie is in the Kintail district, it is near the meeting point of Lochs Duich, Alsh and Long. It is home to what is said to be one of the most photographed castles in Scotland, Eileen Dornan Castle just outside of town. It has appeared in James Bond’s The World is Not Enough, the movie Highlander and in many engagement selfies. Next up is Portree, we stayed at the Bank Hotel. It was late and we were tired, so we decided to nip into the hotel restaurant for dinner. The restaurant itself was decorated more like a hotel lobby than an eatery, but when the food arrived we were pleasantly surprised. We had a great meal of haggis with neeps & tatties, it was one of the best haggis we had during our trip, perfectly seasoned and served hot. Our intent on this road trip was to get to the Isle of Harris but driving from Portree to the ferry terminal proved futile. A big storm was approaching and the ferry operator could guarantee our safe passage but could not assure our return in time to catch our flight out of Glasgow. We made the decision to forego Harris and instead did a loop of the Isle of Skye that turned out to be the highlight of our adventure. The skies were dramatic and changing constantly from blue to grey with rain and snow storms quickly blowing through. Around every corner seemed to be an epic photo opportunity made evident by the many pull outs along the road. This is a place that is bigger than life with sights too big to be taken in without straining your neck. 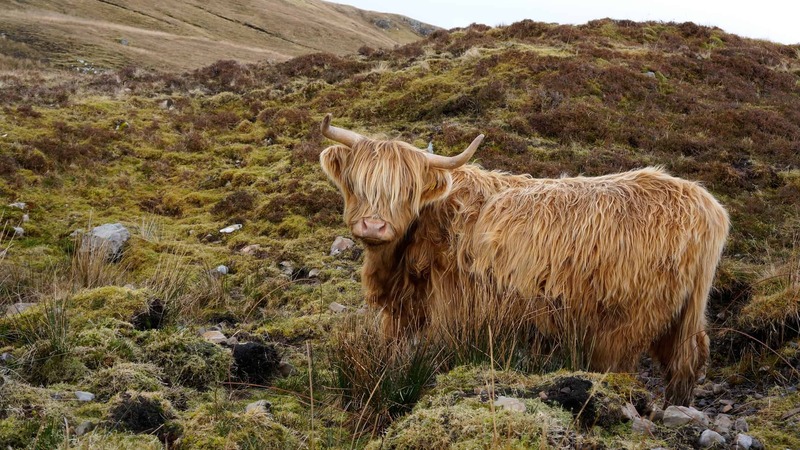 Sheep as white as clouds dot the greener than green pastures and the odd Highland cow will pose for you if you’re patient. The coast line can be extremely dramatic with a wild and brutal looking ocean crashing against its cliffs. Arriving in Inverness during a snow storm, we parked the car and found our hotel, right across the river from Inverness Castle. The town has a lively downtown area with many pubs and restaurants and a large shopping mall. The historic part of town is where most of the good pubs are but the vibe tends to get a little university pub feeling. We found what we were looking for on a point across from the entrance to Inverness Castle called the Castle Tavern. It doesn’t get more authentic than this place with a long list of real ales to choose from and delicious pub fare. Back out on the open road we made what could only be called an epic trip across one of the highest parts of Scotland through an all out blizzard but as we descended the snow eventually disappeared to gorgeous rolling hills covered in thick forest. We pulled off the highway in Pitlochry for the night to stay at a fantastic little guest house just outside of town. 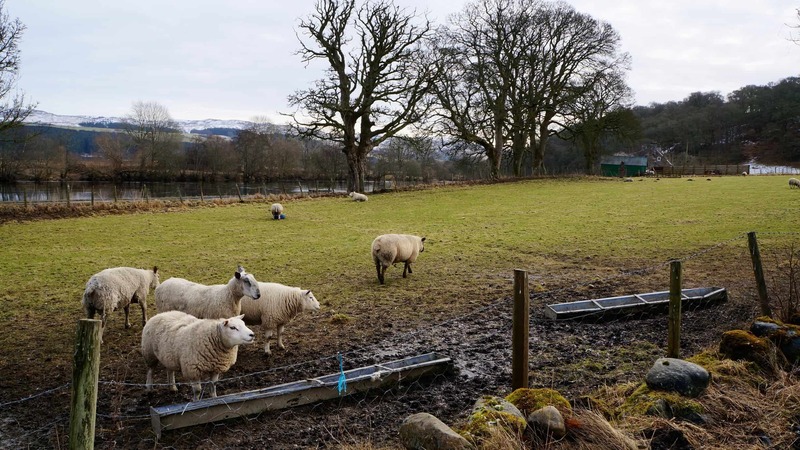 The Cuil-An-Daraich Guest House is clean and comfortable but the biggest treat was the absolutely stunning view from the dining room window across the river Tay, with a snow capped mountain range as a back drop. A very famous and old salmon fishing river, a day’s fishing on the Tay can run you up to £250 and some reservations to fish a certain pool have been held by families for generations. Ring neck pheasants pranced and strutted at every turn. This is the mother land of fly fishing and upland bird hunting. Reluctantly we had to leave the next day to squeeze out a last weekend of fun in Glasgow but we managed to fit in one more castle visit along the way. 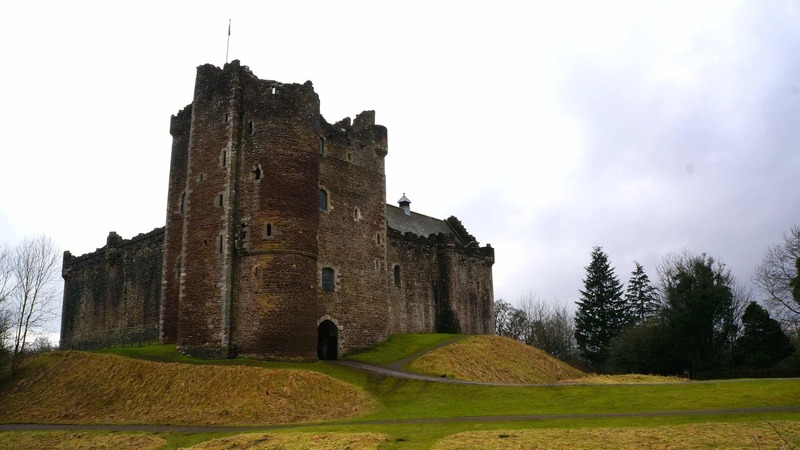 A quick detour off the highway brought us to another Monty Python castle, Doune Castle, it came at a perfect time for us to stretch our legs and take a walk around the castle and down to the picture perfect River Teith, another classic salmon fishing river. A couple of local men were walking their dog and taking a couple of casts. We struck up a quick conversation, trading fishing stories and laughing at each others accents. Road trip over, we decided that we needed to return to Scotland someday as ten days was only enough to touch the surface of this culturally rich country. Remember to drive on the left, especially when turning from one road to another, using a roundabout, using passing places on single track roads and turning out of a driveway. Single track roads might seem easy to manoeuvre but they come with their own set of challenges. Wide enough for a single car, they are dotted with passing places that need to be used properly. When you see approaching traffic, stop in a passing place on your left. Use a passing place on your left to let faster traffic pass. If a passing place is on your right, wait opposite that place to allow traffic to pass. Watch out for animals on unfenced roads. Where would you like to road trip? Together for close to a quarter of a century, A Cook Not Mad‘s Tim and Nat have indulged their passion for life and experience to the fullest, but they feel most alive when traveling, cooking and eating. An award winning chef, Tim has dedicated his life and career to cooking and the pursuit of honest food. As a professional photographer, Nat records their adventures with incredible pictures of everyday life and the extraordinary. They believe that everyone should get to know a culture by learning about the foods they eat and living like locals as much as they can. Scotland is so beautiful. Definitely a country to visit for travelers. I love doing road trips and these scenic landscapes and towns make it an ideal visit to all the places you covered, stunning countryside. It’s such a amazing place with such a rich history. Oh my! Scotland looks stunning. I’m from England and have to be honest, I’ve never ventured that far north. Now you are tempting me. 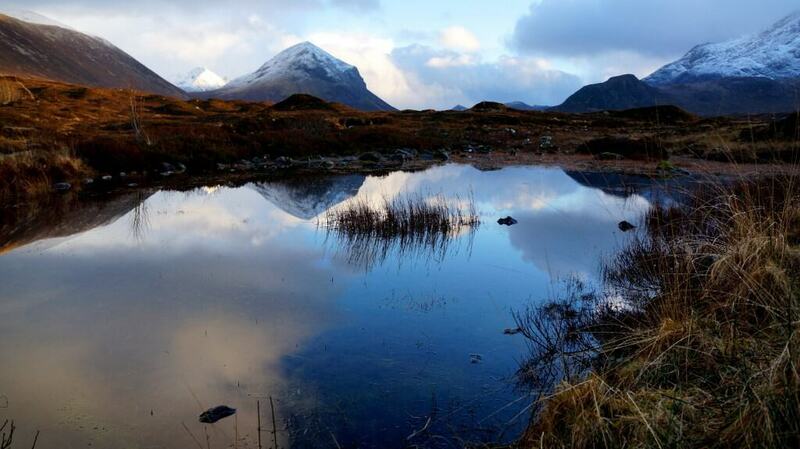 And blue skies in some of your pictures – wow! Castles, majestic countryside, I am sold. You’re so close, you should go! Sounds like a wonderful place to visit by car to see the castles and landscapes—and it is such an intimate way to travel. Traveling by car can get a little costly but it’s the only way to get to some of the most magical and out of the way spots.